A woman in Massachusetts sent me her Western Electric Model 302 to be refurbished. Her father had given her the phone years ago to use as a toy. She had told me how as a young girl she played “operator” using this classic old telephone. She would emulate Lilly Tomlin’s character from the 1960’s television show, Rowan & Martin’s Laugh-In by dialing a number and pretending to be the operator. Now many years later with a family of her own, she wants the phone to look nice again as well as being a usable working telephone. 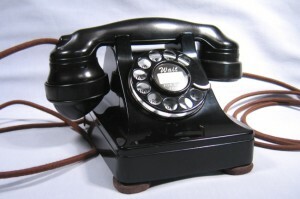 There was one unusual aspect of the telephone however, that was mentioned as a “by the way” type of thing. As a child and while playing with the old desk phone, she dropped it to the floor. As a result both of the rear cradle ears were broken completely off the thermoplastic case. Now many years later, as mentioned she wanted the phone cleaned and put in working condition. When she mentioned the broken ears in our initial e-mail conversation I indicated that I could probably locate a replacement case for her phone—one with all four good ears. She replied that for sentimental reasons she really wanted to keep the original housing. So the phone was shipped to me to do what I could to spiff up the phone, add new cords, clean the dial, get it ringing and send it back. What resulted actually turned out to be more than both of us had bargained for when work began. Thanks to my good friend and long time telephone collector Mark Scola, new cradle ears were created. This phone is a real Heinz 57 of telephone parts. Usually when one sees a model 302 with an E1 handset, the case is made of steel. They were made of steel until WWII when the thermoplastic sets were produced. Sometime along the way this case was replaced. 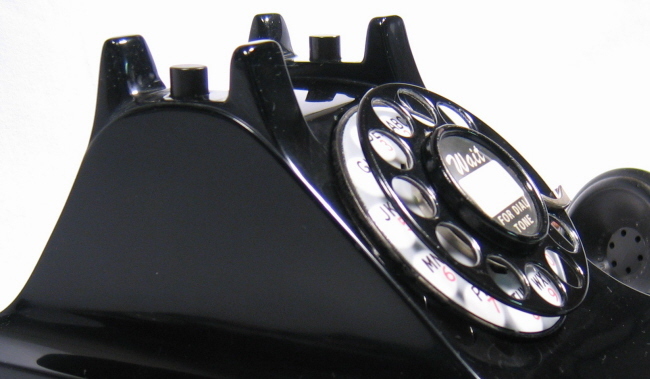 The handset has parts dated from 1937. 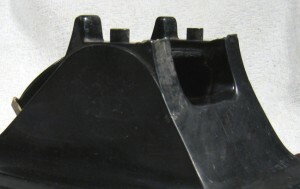 The plastic housing from 1945. The base of the phone is dated December 1941, as was the ringer. The dial is the older #4 dial. It has what many call that “clickety-clack” sound to it. Take a moment to view my Picasa web album and see the progression of the refurbishing process including the formation of the replacement cradle ears by Mark Scola. I put together some photos of what was done to make this a very nice, working presentable Vintage Rotary Phone. If you’d like to hear the sound of the dual harmonic brass ringer bells, I have made a sound clip available, along with the sound of the refurbished #4 dial. 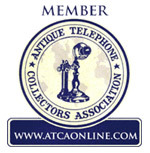 Mark Scola has been collecting antique telephones for over forty years. He is a member of the Antique Telephone Collectors Association and is currently on the board of directors for the Telephone Collectors International. Fantastic job! Hard to believe it’s the same phone, I would never have guessed those broken ears could be replaced. Thank you Heath. I never could have done that without the efforts of my friend Mark Scola who built and shaped the ears. He has been experimenting with that process for a while. He has done some nice repair work on rare color 302 sets. The problem he’s having is matching the color of the plastic as when it dries it often turns a bit different in color than the original plastic. But it still looks better than a gaping hole. This was a learning experience for both of us. The black color matched perfectly. While the ears were still in their rough form I never really thought they would polish with the shine that they did. Thanks for the comment. Very nice job that the two of you did on that phone, Dennis. That’s also a pretty comprehensive “lesson” on your Picasa web album. Thank you Dave. Mark has been doing some of that repair work for a while, continuing to perfect his method. It has come in handy for repairing split corners and other damage that these phones have suffered over the years. I appreciate your comment. Dennis, what can I say? You have breathed new life into this very special phone of mine! My “one ringee dingee, two ringee dingee” phone has tremendous memories for me from when I played with it during the mid/late 60’s to early 70’s. 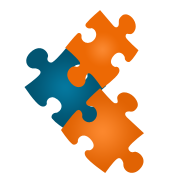 You have really done an amazing job with it and I am astounded at the care and work that you have put into it. Your emails, your updates, etc — every bit of contact showed tremendous respect for me as a customer but also showed your passion for revitalizing vintage phones.. I honestly can’t say enough! I wish you nothing but the best and may every project you work on bring you and your customer pleasure!!! Thank you! Your comments are really appreciated—and you haven’t even seen the phone in person yet! (It will be in tomorrow’s mail). This telephone was fun to work with right from our first e-mail conversations. I’m glad that you decided to let Mark Scola create the replacement ears. It is amazing how close they look to the real thing. Your desire to recreate a part of your past kept this very nice piece of American history out of the dumpster. It was my job to help make this possible. I can’t wait for you to open the box, pull out your “new” phone, plug it in and listen as you use that #4 dial. And when you finally get a call, the ringing will be icing on the cake. Thank you very much for trusting me with your Vintage Rotary Phone! Thanks for the Telephone sounds. It’s like candy to my ears. and the rotary dial sound wow! It woud be so cool if you could bet the actural ring tone. Thank you for the comment, John. I’m glad you enjoyed your visit to my post about this Western Electric Model 302. With regard to the ring tone, I have heard of one collector that managed to record the sound and upload it to his cell phone. It was as clear as the original. Much nicer than those we hear on cell phones from the factory.